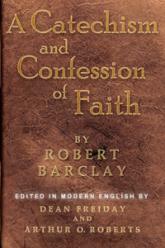 Robert Barclay (1648-1690) is most widely known for writing the Apology for the True Christian Divinity. But this was not his first important Quaker work. A Catechism and Confession of Faith was written in 1673, about seven years after his convincement of the truth, and when he was only 24 years old. Paul Anderson: " . . . An excellent discussion resource and study guide for young people and adults alike seeking to be deepened in Quaker beliefs and perspectives . . . ."